Have you ever dropped anything into the water and wondered about the best method to find the it? Are you a treasure hunter and looking to explore the bottom in more detail? The PADI Search and Recovery Specialty course is a great way to learn underwater navigation and search techniques to cover all eventualities of good or limited visibility. Students also learn how to rig and attach an object to a lift bag as well as the most effective and safe way in which to lift the object to the surface. The PADI Search and Recovery course is one of the most fun and action packed of all the specialty programmes and is also the most useful if you ever drop anything valuable over the side of the boat! 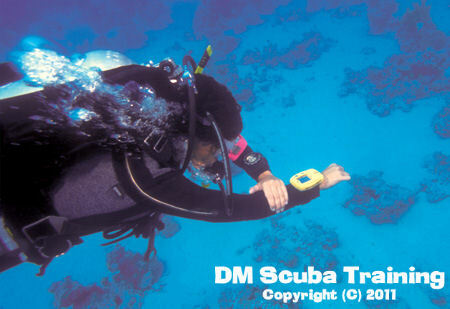 As this course involves 4 Open Water dives we usually conduct this course over a weekend. 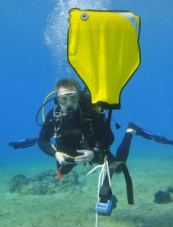 As well as the four dives there is also a classroom element which can be done at the dive site. • Proper techniques and safety considerations for recovery of objects using various lifting devices. Another point about search and recovery is that it is directly and indirectly rewarding. It's directly rewarding because it's a fun challenge and something different to do underwater, like a treasure hunt or beach clean-up. It's indirectly rewarding when your search has a specific purpose, such as retrieving an elderly person's lost prescription sunglasses or the brand new wide angle camera lens accidentally dropped over the side. And, it goes without saying that if you dive for long enough, you'll have to search for something that you or a fellow diver accidentally drops in the deep. Besides learning how to search, if the object is too big to swim topside, you also need to learn ways to safely raise it to the surface. You learn both search patterns and how to recover objects in the PADI Search and Recovery Diver course. You will use what you learn not just once, but many times over. 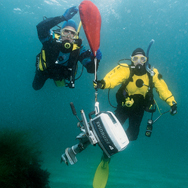 Many deep divers wear dry suits on almost every dive due to the length of the time spent underwater. The longer the diver is in the water, the more thermal protection is required and if you're down there looking for something that's lost... You may be a while. If dry suit diving is something that interests you, check out our Dry Suit course! Normally held at an inland dive site around Bristol. One day completing three dives or two days completing four dives, depending on whether you have already completed your Search and Recovery adventure dive. Learn how to use Enriched air up to 40%. Click on the photo to learn more! Learn to Dive with a DPV! Click on the photo to learn more! Learn how to navigate properly! Click on the photo to learn more!